Great first Bible for beginners learning God's Word! She Rises Bible from the 2016 She Rises Women's Conference in Los Angeles. New Living Translation Bible - Available here. Battlefield of the Mind by Joyce Meyer - Available here. Without Rival by Lisa Bevere - Available here. Have you ever found yourself in over your head, wondering how you would possibly get through with your faith and sanity intact? It can happen any time. Life seems good and then—BOOM!—out of nowhere comes a storm that threatens to drown your hopes. Your storm might be a job loss, loneliness, a crumbling relationship, financial ruin, a serious illness, or the death of a loved one. Whatever it is, as the winds howl and the waves rage, you have a choice: will you cower in fear or will you rise to the challenge? Cancer survivor Holly Wagner has endured her share of storms. In Find Your Brave she examines the dramatic shipwreck faced by the apostle Paul in Acts 27. There she uncovers profound truths that will guide you safely through life’s most difficult moments. Through solid biblical teaching and relatable personal stories, Holly offers an uplifting, friendly voice in the midst of the gale-force winds and overpowering critical voices. She shows you how to anchor your trust in the God who remains faithful in every storm and in whose strength you can Find Your Brave. Find Your Brave by Holly Wagner - Available here. According to Pastor Mark Batterson in his book, The Circle Maker, “Drawing prayer circles around our dreams isn’t just a mechanism whereby we accomplish great things for God. It’s a mechanism whereby God accomplishes great things in us.” Do you ever sense that there’s far more to prayer, and to God’s vision for your life, than what you’re experiencing? It’s time you learned from the legend of Honi the Circle Maker―a man bold enough to draw a circle in the sand and not budge from inside it until God answered his prayers for his people. What impossibly big dream is God calling you to draw a prayer circle around? Sharing inspiring stories from his own experiences as a circle maker, Mark Batterson will help you uncover your heart’s deepest desires and God-given dreams and unleash them through the kind of audacious prayer that God delights to answer. The Circle Maker by Mark Batterson - Available here. Victory Over the Darkness by Neil T Anderson - Available here. Or perhaps your life doesn’t look the way you thought it would right now; maybe that dream is just beyond your reach as the words Not Yet appear stuck on repeat. Are your fears, failures, and imperfections trying to define your future the longer you are “on hold”? In The Power of Not Yet, Donna Pisani focuses on four powerful principles that not only changed her life but have done the same for countless others as well. With each principle she dismantles the lies of fear, failure, and imperfection that keep your purpose and potential hidden while addressing how to live with confident boldness in the middle of your Not Yet Zone. Through personal stories, biblical insights, and research, Donna delivers the simple truth that you were created for greatness and that every part of your life—past or present—is an incubator to discovering how to live the life of endless possibility God has designed for you. •How to flip the light switch, expose the fears, and identify common lies you’ve been soothing for far too long. •The small steps that will significantly impact you in becoming smarter and stronger while you wait in the process. •How God has already written you win all over your story, and how to see it and say it while understanding God’s purpose is always bigger than what you can think or even imagine. •How to lead yourself well and discover the purpose God has placed in you, removing the confusion of knowing how to start. If you long to get moving, discover what God made possible in you, and be the world changer God's called you to be, this book is for you. The Power of Not Yet by Donna Pisani - Available here. Nothing To Prove by Jennie Allen - Available here. Co-authors and best friends Jess Connolly and Hayley Morgan have felt the same, until one essential question turned the tables on it all: If God is wild and free and he created women, what does this mean for us today? Wild and Free by Jess Connolly and Hayley Morgan - Available here. The "uncalled" life can feel like a prison sentence. As women, we yearn for purpose, meaning, and significance. In "Find Your Calling: Discovering What You're Meant To Do: A 21-Day Guide For Her" Veronica and Dale Partridge lay out an incredible journey to unearth the talents and gifts that make up who you are. Find Your Calling by Veronica & Dale Partridge - Available here. In a crazy, media distracted world the important questions often get lost like: What's your passion? What's your purpose? Who do you want to be? Alexis Jones has built a career listening to and helping girls around the world figure out those questions in order to inspire them to think for themselves, to speak their truth, to discover their purpose, and to dream HUGE! Alexis believes that you're not broken nor do you need to be fixed. You already are that girl who creates magic wherever she goes, who lives fearlessly, who inspires those around her to dream bigger, and who will leave the world better, just for having been in it. Stop listening to that voice inside your head that tells you you're not good enough. Stop worrying that you don't have the perfect body, perfect job, perfect relationship, or perfect anything for that matter. Stop letting other people draw boundaries and limits around your life. And start living the life that you truly want (now! ), the one you didn't think you had the courage to imagine, but the one that's absolutely possible! 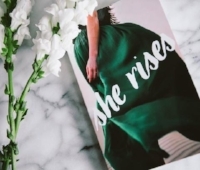 Including stories from thirty incredible women, Alexis has compiled everything she's learned into one complete guide to being That Girl, the best version of you. I AM THAT GIRL by Alexis Jones - Available here. Big Magic by Elizabeth Gilbert - Available here. I am witnessing a phenomenon. It seems as though a growing group women entrepreneurs all around the world has discovered the secret to success and happiness in both their lives and careers. It’s almost as though there is a hidden, underground world of power playing females who have all cracked a magical code: they think positively, they support one another, and they truly believe they can have it all —and you can, too. There is something dynamic that happens when women genuinely show up for each other. When we lose the facades, when we cut the bullsh*t, and when we truly have each others backs. When we stop pretending everything is perfect, and we show the messy, beautiful parts of ourselves and our work that all look awfully similar. When we talk about our fears, our missteps, and our breakdowns. And most importantly, when we share our celebrations, our breakthroughs, and dish on what works. There is no reason to hoard information, connections, or insight. Wisdom is meant to be shared, so let’s start sharing what we’ve learned to make each other better. Let’s start building each other up. Let's live up to our potential and start ruling the world. GIRL CODE is a roadmap for female entrepreneurs, professional women, “side hustlers” (those with a day job who are building a business on the side), and anyone in between who wants to become a better woman. This book will not teach you how to build a multimillion dollar business. It won’t teach you about systems or operational processes. But it will teach you how to build confidence in yourself, reconnect with your “why,” eradicate jealousy, and ultimately learn the power of connection. Because at the end of the day, that’s what life and business is all about. GIRL CODE by Cara Alwill Leyba - Available here. Esther by Beth Moore - Available here. Breaking Free by Beth Moore - Available here. Entrusted by Beth Moore - Available here. Author: Priscilla Shirer is a wife and mom first, but put a Bible in her hand and a message in her heart, and you'll see why thousands meet God in powerful, personal ways at her conferences. With a Master's Degree in biblical studies from Dallas Theological Seminary, Priscilla brings the depths of Scripture to life. Her Bible studies span such topics as Exodus, hearing the voice of God, and biblical characters like Jonah and Gideon. She has also written many books, including the New York Times bestseller The Resolution for Women She and her husband, Jerry, lead Going Beyond Ministries, through which they provide spiritual training, support, and resources to the body of Christ. They count it as their greatest privilege to serve every denomination and culture across the spectrum of the church. Armor of God by Priscilla Shirer - Available here. Jesus Calling by Sarah Young - Available here. His Princess by Sheri Rose Shepherd - Available here. Sometimes, the broadcast is available here before it even airs on TV! Download the official Joyce Meyer Ministries app now and begin enjoying everyday life. Joyce Meyer Ministries - Available here. Living Proof Ministries, founded by Beth Moore (1994) is dedicated to encourage people to come to know and love Jesus Christ through the study of scripture. Living Proof Ministries with Beth Moore - Available here.